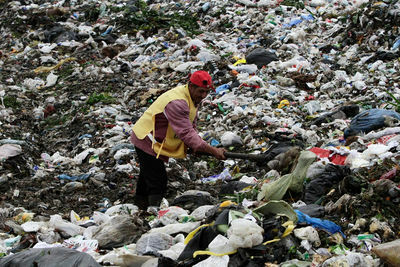 Catuera is home to the largest landfill in Asuncion, the capital of Paraguay. 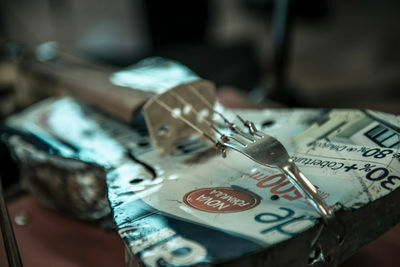 Here, a young orchestra defies all odds, making their instruments from garbage. 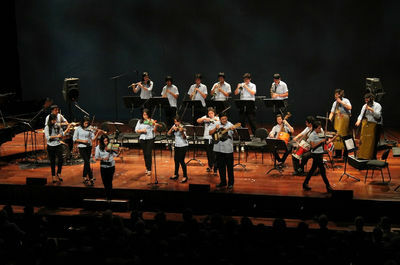 Despite the extreme poverty in which most residents of Catuera live - in cardboard, wood and sheet-metal shanties and exposed to numerous health and safety hazards - this orchestra allows young people from eight to twenty-two years-old to access culture and also to improve the living conditions of their families. This may well prove that the trash of some is treasure to others. 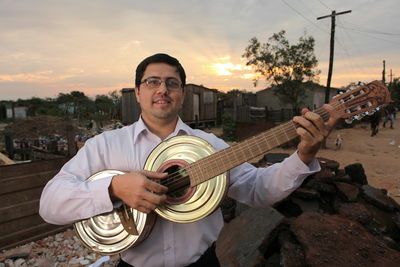 The project began in 2006 when Favio Chevez Morán, an environmental engineer and music afficianado working in the neighborhood, began to teach music to the youth of Cateura with the help of Nicolás Gómez (known to locals as Don Cola), a recycler who makes instruments out of trash, and a young French volunteer. There are parallels here between recycler and artist. Both seek something in the trash to give it new significance, new life. Little by little, their efforts transformed informal music classes into a long-term project: an orchestra, a new challenge for these young people. The project’s success led the American heavy-metal group Metallica to invite the orchestra to join them on their South American tour this year. Since then, they have played more and more concerts, sharing a unique musical experience in Paraguay as well as Germany, Spain, Austria and countries around the world. A Cateura, le décharge plus grande d’Asunción, la Capitale du Paraguay, une orchestre défi les limites de l’impossible en faisant ses instruments à partir de déchets. Même si la plupart des habitants vit en situation d’extrême pauvreté, dans des maisons en carton, en bois et en tôle, exposés à de nombreux dangers, cet orchestre a permis aux jeunes de 8 a 22 ans d'accéder à la culture et aussi d'améliorer les conditions de vie de ses familles. Cela prouve que les déchets des uns peuvent être la richesse des autres. Ce projet commence en 2006 quand Favio Chavez Morán, un technicien environnemental amateur de musique qui travaille dans ce quartier défavorisé, commence à enseigner la musique aux enfants et aux jeunes de Cateura, aidé par Nicolás Gómez (alias Don Cola), un recycleur, qui fabrique les instruments avec les ordures et un jeune volontaire français qui collabore avec l'organisation. De cette manière, on peut dire qu’il y a des parallèles entre un recycleur et un artiste, ils cherchent des choses dans les ordures pour leur donner une nouvelle signification, une valeur différente. Peu à peu, avec l'effort et le travail de tous, les classes de musique sont devenues un projet à long terme: un orchestre. Et aussi un nouveau défi pour ces jeunes. Le succès a commencé avec l’invitation de Metallica à participer à la tournée de concerts en Amérique du Sud cette année. Depuis lors, les concerts sont de plus en plus nombreux, au Paraguay comme à l'étranger, en Allemagne, en Espagne, en Autriche, ils parcourent différents pays et transmettent cette expérience unique. The orchestra's director Favio Chavez Morn plays a tune on "Don Cola's" latest recycled instrument. 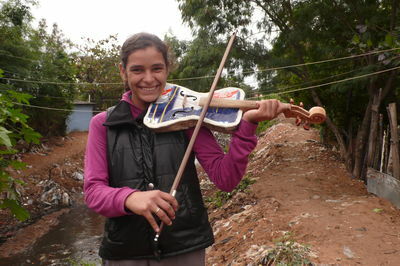 A student in the orchestra shows off her violin in the neighborhood in Catuera where everyday junk has taken on a new music. Nicols "Don Cola" Gmez poses with two of his creations, a classical guitar made of recycled tin cans and a violin made of sheet metal. 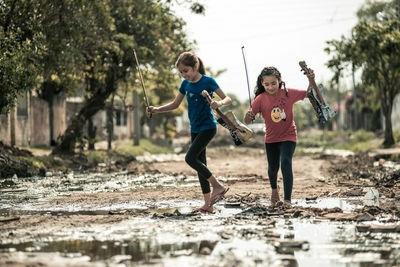 A violin made from recycled tin and a bent fork will be played by a child from Catuera, one of Paraguay's most disadvantaged neighborhoods, in an orchestra aimed at giving the youth a creative outlet. Two students in the orchestra walk home with their instruments, newfound source of daily motivation and creativity. Nicolás "Don Cola" Gómez, the junkyard recycler, picks through the dump looking for suitable materials to create his recycled instruments. 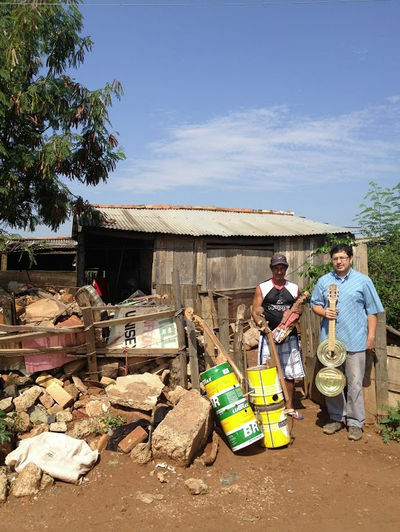 Don Cola and the orchestra director Favio Chavez Morán hold up two finished instruments. 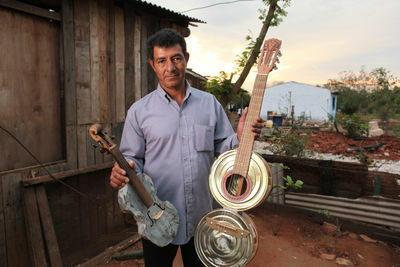 Thomas Lecourt, a French volunteer, plays with the Orchestra of Recycled Instruments of Catuera. 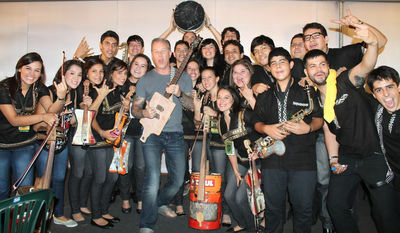 The orchestra strikes a pose with Metallica's James Hetfield before their performance in Brazil. 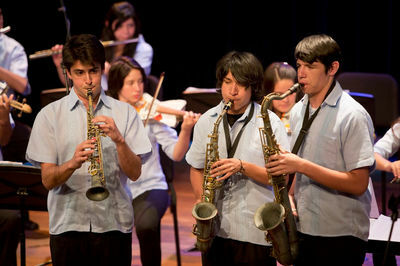 The orchestra plays a concert for a large public audience.